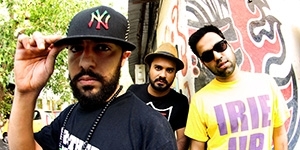 Reggae Rajahs (Diggy Dang, DJ MoCity and Mr. Herbalist aka General Zooz) are India's first reggae sound system. Known for their energetic live performances, they are reggae entertainers and promoters based out of New Delhi. Formed in 2009, Reggae Rajahs have dedicated themselves to spreading the sounds of reggae music across India. They frequently perform at clubs and live venues all over the country and have also performed at many festivals including Sunburn Festival (Goa), SulaFest (Nashik) and Ragasthan (Jaisalmer). They host their own stage at the NH7 Weekender Festival called the ‘Dubstation’ which has introduced thousands of people to dub based sounds over the last two years. The year 2012 saw Reggae Rajahs make their first appearance on the European scene, playing club shows in Oslo and Budapest and performing at major festivals including Uprising (Slovakia) and Outlook (Croatia). In January 2013, Reggae Rajahs were chosen as the opening act for Snoop Dogg aka Snoop Lion in New Delhi. They have also performed with a number of established international artists such as Dub Inc. (France), Million Stylez (Sweden), Ziggi Recado (Holland), Apache Indian, Mr. Williamz, Brother Culture, Soom T, Mungo's HI Fi (all UK), Supa Bassie & Sargento Garcia (Spain), Dreadsquad (Poland) and Subatomic Sound (USA). Reggae Rajahs have also been nominated for the Best International Group award at the British Reggae Industry Awards (2012) alongside illustrious Jamaican artists such as Toots & the Maytals, Mighty Diamonds and Third World.